Definitely Not Your Grandparents' College Sports! Who says you have to go the traditional route and play old-school baseball or football? Take a look at some of the most entertaining and strangest sports being played at colleges and universities throughout the United States these days. Who knows, maybe you’ll find your next passion! Looking to take the next step? Search for sports scholarships on CollegeXpress! Love swimming and diving but hate ice? This sport pretty much covers you on that front. Get the excitement out of playing hockey—at the bottom of a swimming pool! You’ll suit up with fins, a mask, a snorkel, protective gear, and a one foot long–stick. 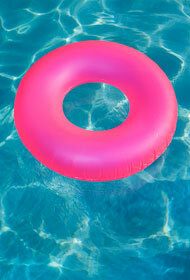 The puck weighs about three pounds, so you better be ready to hit the pool floor. It’s very similar to hockey, except no physical contact is allowed. The goal, of course, to score as many goals as possible. George Mason University has a club team definitely worth checking out. Got a broom? Awesome, you’re on the team. Created by J.K. Rowling for the Harry Potter book series, Quidditch is becoming a hot new sport in the college circuit. For this game, each team is comprised of seven (this can change depending on amount of people playing the game) players on the field: chasers, keepers, beaters, and seekers; and each have their own specific responsibility. In addition to the players, there are three balls in play: a quaffle (normally a slightly deflated volleyball or basketball), a bludger (dodgeball or softball), and the snitch (tennis ball in a sock or just a small flag attached to the waistband of the snitch runner). Plain and simple goal of the game is for the seeker to grab the snitch. It’s an intricate sport, as I’ve learned, so you better read up on the rules before trying. I highly suggest taking a look at Middlebury College and their Quidditch program. They were the first in the country to start this trend and now according to the International Quidditch Association, there are about 300 programs worldwide! Inner-tube water polo is a sister to regular water polo, except, you guessed it: you use inner tubes. Basically it boils down to would you rather float along or be swimming for 40 minutes? That being said, my vote is for the inner tubes! You don’t hear those words everyday! Although not really a regularly played sport throughout the year, it seems that it’s being played at schools tournament-style. It’s exactly what it says it is. All you need are some ultraviolet black lights, a volleyball court, and you’re set. Although blacklight volleyball is not a sport like the others above, it’s a great example of how weird athletics can get. It also shows you that you can transform a regular sport into something new and different and something that I’m sure your school’s student activities/athletics department would be very excited to help you put together. The NCAA Division Quiz: Where Do You Want to Go?